A.I. Produced 'Portrait' Will Go Up For Auction At Christie's The print, called Edmond de Belamy, is a blurry depiction of what could be a "a man of the church" floating within a gilt frame. In place of the artist's signature is a math equation. Edmond de Belamy, created using artificial intelligence, will be auctioned at Christie's on Thursday. A new portrait that is vaguely reminiscent of something painted by an old master is headed to Christie's New York auction block later this week, making it the first computer-generated artwork up for sale at a prestigious art house. The print, called Edmond de Belamy, is a blurry depiction of what could be a "man of the church" against a dark background, floating in the upper left corner of a gilt frame. 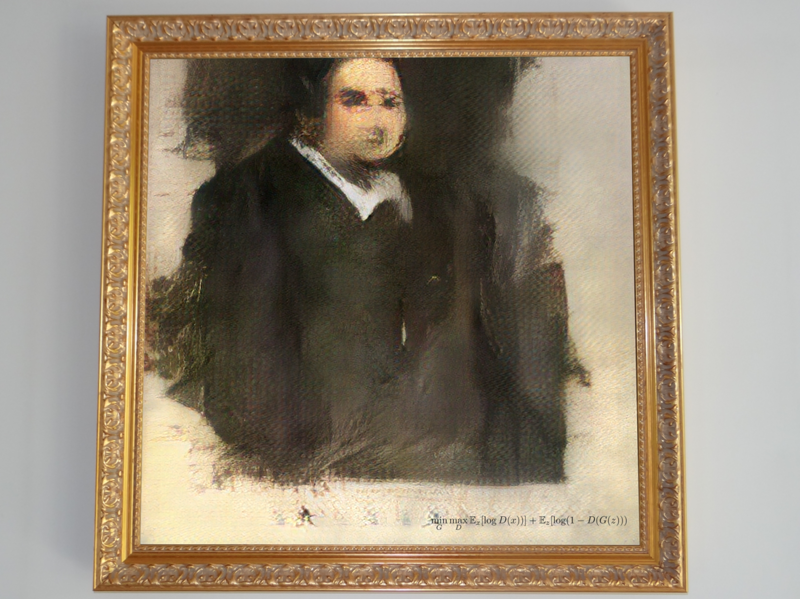 It was created by Obvious, a Paris-based art collective that has been using artificial intelligence to make a series of "paintings" since they began the project last year. Each image is printed on canvas with inkjet then "framed and signed with the math formula" used to create it in the lower right corner, the group explains on its website. "The whole process is about humans having as little input as possible in the finished piece," Gauthier Vernier, one of three 25-year-olds who comprise Obvious, told Time. Christie's says the trio — Vernier, Hugo Caselles-Dupré and Pierre Fautrel — are "engaged in exploring the interface between art and artificial intelligence." Their primary method is the use of Generative Adversarial Networks. These are algorithms composed of two competing parts that ultimately teach themselves through trial and error, as opposed to being programmed by humans. "We fed the system with a data set of 15,000 portraits painted between the 14th century to the 20th. The Generator makes a new image based on the set, then the Discriminator tries to spot the difference between a human-made image and one created by the Generator. The aim is to fool the Discriminator into thinking that the new images are real-life portraits. Then we have a result." "I just find it amazing that some young people built a program allowing the creation of an original artwork, based on a selection of the 'bests' from past art history," Laugero-Lasserre, said in an interview with Artnet News. He also called the approach "grotesque and amazing at the same time." As NPR's Allie Caren reported, robotic paintings are not a new concept. They date back to the mid-1970s and can be traced to AARON, a software written by artist Harold Cohen. "Every couple generations you have something that happens that begins to redefine what we consider art," Erin-Marie Wallace co-founder of Rare-Era Appraisals told NPR's All Things Considered on Monday. "We are redefining what art actually is for the 21st century," she added, noting that "art is valued at what people are willing to pay for it." Fautrel, who is studying business, acknowledged that being championed by Laugero-Lasserre and Christie's has pushed open the doors to the traditional art world for the collective. "At the beginning a lot of people were like: 'Who are these guys? What are they doing?' " Fautrel told The Telegraph. "But now we are considered true artists."